Kate's Curious Kitchen - Page 2 of 6 - Exploring adventures in the heart of my home and connecting people through stories told by food. 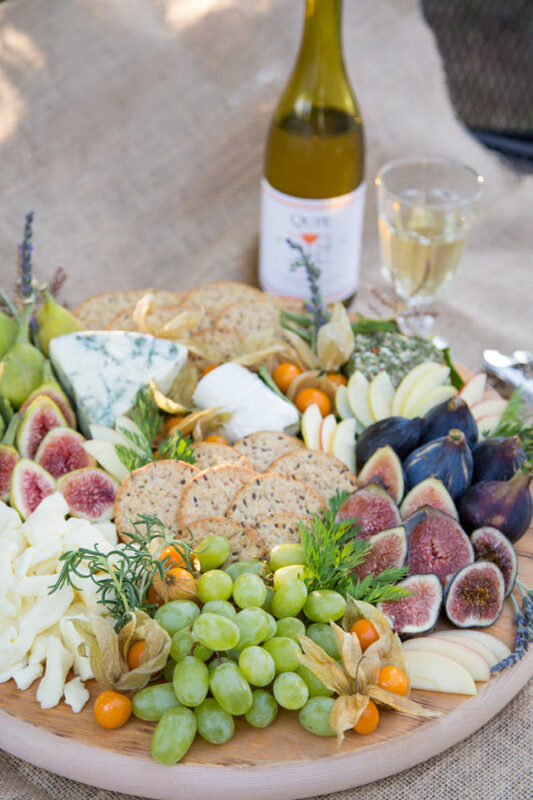 I love a beautiful cheese plate, I love it a bit more when I make it for my friends. 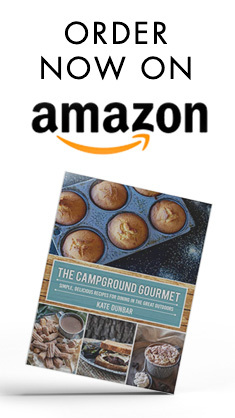 In the camping group I belong to, Sisters on the Fly I am know for being the Sister who introduces many to the glorious flavors of Mt Tam, Humboldt Fog, Triple Creme, Chèvre and many more. 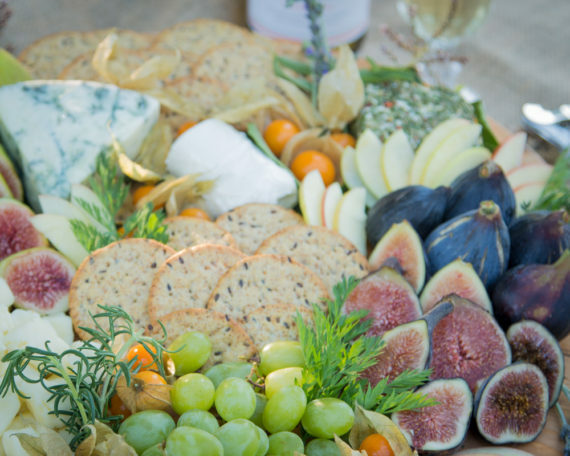 My key ingredients: soft cheese, hard cheese, dried fruits, fresh fruits, nuts, fresh herbs and good tasting crackers. Below I have everything broken down for you to successfully create a stunning cheese platter. Pictured is a bottle of Qupe Viognier wine, it has a light floral note along with a delicate peach and apricot taste which is perfect for all the flavors I have presented in this image. Soft Cheese; Brie, Camembert, Chèvre (goat), Mozzarella, Cream Cheese. They are very soft, creamy and buttery in flavor. Semi-Soft; Havarti, Munster, Fontina, Dorset. These cheeses have a soft earthy flavor they go very well with dried fruits and jams. Medium-Hard; Gruyère, Gouda, Edam, Cheddar, Monterey Jack, Parmesan, Pecorino. These cheeses are sharp in flavor, low in moisture and have aged for a period of time. Strong Flavor Soft Cheese; Blue, Gorgonzola, Roquefort and Stilton. These cheeses are salty, strong in flavor and tend to have a distinct musky odor. I love dried fruit especially in the winter when everything is just about out of season. Turkish apricots, golden raisins, cranberries, dates and figs. If I have time I will take the dates, remove the pit and place a good dime size piece of gorgonzola cheese in them. That strong salty cheese is perfect for the sugary sweet date. If I really have some time I will wrap a piece of bacon around it and broil for about 15 min then drizzle with a good aged honey & fig balsamic vinegar. Pistachios from the Santa Barbara Pistachio Farm (we have them here in Texas! ), seasoned pecans, almonds and if I can get them whole and walnuts. I place the walnuts in a bowl with some chopped rosemary, sea salt, cracked black pepper and I drizzle a bit of honey mix well and serve in a olive bowl. Water crackers, unflavored is my choice and they are the best serves with Brie cheese or your Blue cheeses. Herb toasts are perfect with Chèvre, multigrain are amazing with well aged cheddar and the crackers with dried fruits and nuts pair very well with Camembert. Sometimes you need to fill in some space or make the plate look a bit dressed up, fresh herbs over flowers are my go to every time. I like rosemary, dill, parsley, thyme, chives and sage leaves. All right, its seriously grey here in Central Texas. Its like Eeyore has just decided to bring his gloomy attitude here and sit a spell. I sat there looking out the windows at the leafless trees, the dead plants from our two great freezes and I had to do something. 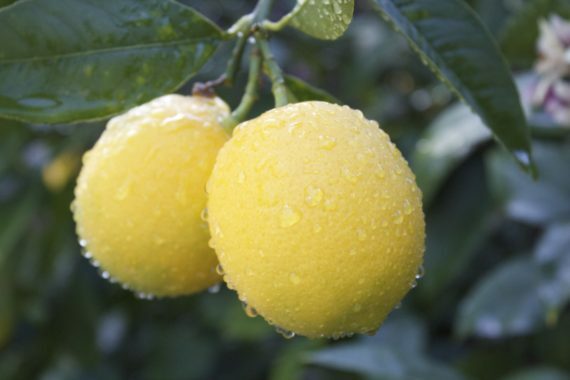 I had a few lemons and right away I knew no matter what I was going to get the sun to come out. So I’m doing a 30 day lemon challenge! That’s right, every day I will make something to eat or drink that has lemon in it. I will be posting on my Instagram page “Kate’s Curious Kitchen”. 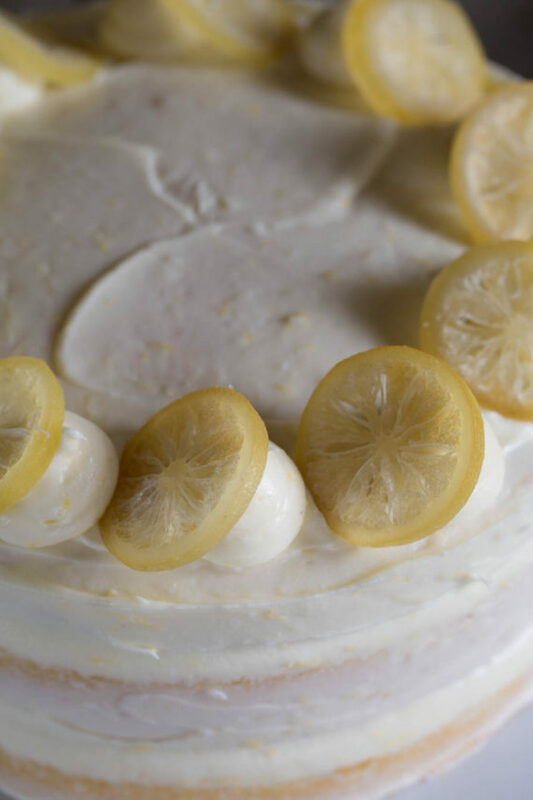 Please join in and share your lemon creations too. The more folks/people/followers participating the faster winter might finally be chased away. I long for Spring time here in Texas. It is magical, from the wildflowers, to the new tree buds, the birds and the precious longhorn calves. If you have never visited the Hill Country of Texas the area I am talking about is roughly 25 counties, which spans from San Antonio north to just above Lampasas, then Austin on the east side to Junction on the West. 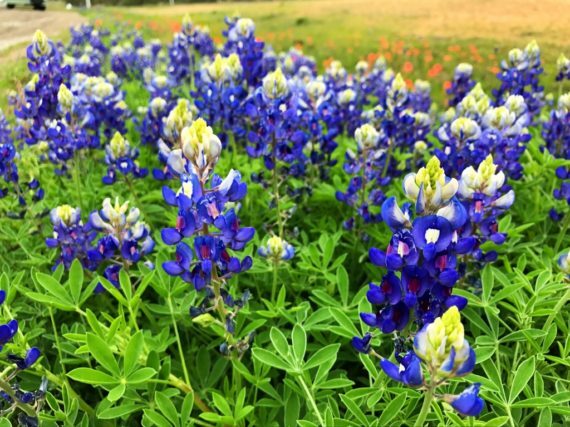 This area screams winter is over when the blue skies touch the ground here with one small cobalt to periwinkle blue and bright white tipped flower, the Texas bluebonnet. You can not drive down a road with out stopping. They say no Texas family photo album is complete until there is a baby picture with that little one sitting in the sea of bright bluebonnets. So my challenge is simple. I need to use a lemon everyday for 30 days either by creating a new recipe or finding one in my over 500 cookbooks then cook! I’m going to call the sun out of its slumber with dishes like lemon ricotta pasta and grilled salmon with a white peppercorn and lemon sauce. I might possibly sip a lemon drop martini or make my smashed blackberry and bourbon cocktail with a lemon twist. Then I will coax that beautiful sun with my famous lemon bars (I was in Sunset Magazine for them) or my precious cafés signature lemon cake. Matter of fact that is where I’m starting! So join along with me in this bright, cheery and fun food challenge! 1. Grease three 9-inch by 2-inch pans with butter or cooking spray, just not butter flavored spray. Line the bottom with parchment paper and grease the top of the parchment. Preheat your oven to 350 degrees. 2. In a stand mixer, cream the butter and sugar together, two minutes, scrape bowl down and add almond extract. Mix again for 30 seconds. 3. Add egg whites and milk together, mix with a fork until combined. Add lemon zest in and mix again. Set aside. 4. In a clean bowl add cake flour, baking powder, and salt. Mix well. 5. Add 1/3 of the dry ingredients to the butter mixture and mix in until no traces of flour remain. Add in half of the milk mixture and mix until smooth. Add in another 1/3 of the dry ingredients until no flour traces remain followed by the remainder of the milk mixture. Add in the last of the dry ingredients and mix until just combined, using a rubber spatula to scrape the bowl to make sure all the dry ingredients are mixed in. 6. Divide the batter among the three prepared pans. Bake at 350 for 25 minutes for about 35 minutes or until an inserted cake tester come out clean. Once done, let pans sit on a cooling rack for 10 minutes then turn out and cool completely before icing. Mix will and keep in a tightly sealed jar for up to 1 month. 1. In the bowl of a stand mixer fitted with the paddle attachment, or in a large mixing bowl using an electric mixer, beat the butter and cream cheese on medium speed until smooth. 2. Add in the powdered sugar and mix on low speed at first, then increase to medium speed and continue mixing for another 1-2 minutes until the mixture starts to come together. 4. Ice cake and keep in the fridge until ready to serve. The Church of Jesus Christ of Latter-day Saints in 1881 built a beautiful church and social hall. The church was nestled among the coconut trees and taro fields in the small little town of Laie. One day in 1940 that beloved church was engulfed in flames that could be seen for miles, the town of Laie was so small there wasn’t a fire station or a fire truck, just a volunteer fire department. They raced into action along with the other town member, the bucket brigade from the ocean could not save the beloved church. The only structure that survived was the social hall which was not big enough for the congregation to meet. After the flames were put out, the damage was assessed a decision had to be made, rebuild or not. The decision was simple, rebuilding the church was not only wanted it was necessary for the community. However, the town needed a way to raising money for the construction. The idea of having a Hukilau was meticulously thought out, tickets would be sold to fund all the construction costs. Fishermen threw nets into Laie Bay and pulled pounds and pounds of fish in for the men tending the fires to cook. It was a food feast, little grandmas made two finger poi and poi buns, fresh vegetables, coconut desserts, you could eat for days! 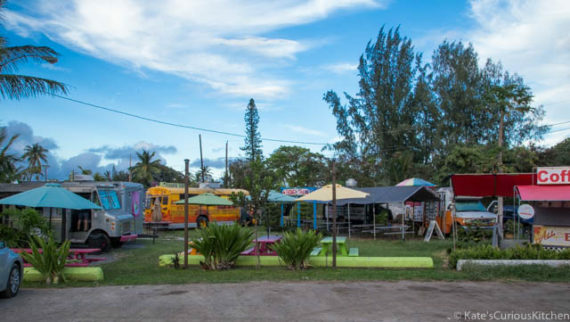 The shock was not only did they sell every ticket, they had another thousand guests show up from all over the island! Here is the musical recount and tribute to that community food share. Down at old Laie Bay. Oh, we’re going to a hukilau. The huki, huki, huki, huki, hukilau. Oh, we’re going, to a hukilau. Right there in Laie, across from the bay where that famous event took place sits the Polynesian Cultural Center. A favorite stop of ours and it should be on your must visit list, here’s an insider tip, your tickets allow you to come in a total of three visits. My children loved going from village to village learning all about the culture, playing traditional games, learning how to use musical instruments and then sampling the cuisine. I watched the time honored tradition of prepping the Imu for kalua pork. 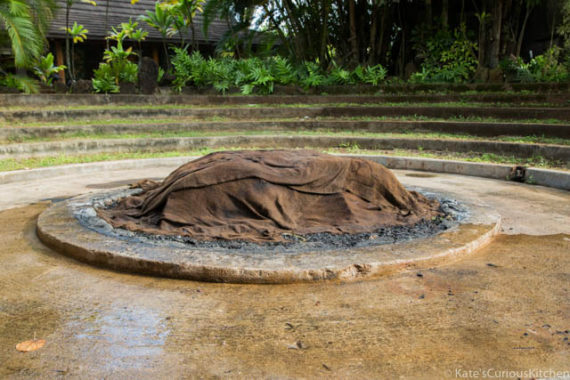 Layers of hot volcano rocks, banana leaves, ti leaves and wet burlap sacks were strategically placed in and around the pig for its slow 12 hour underground cook. I might have gone back into an area that said employees only, but they were amazing and said I could stay and watch. Score one for me! For a special treat when you visit PCC make sure to visit the village of Samoa and go find Kap Te’O Tafiti, trust me he will surprise you!!! Of all the lessons I have learned when I have traveled to the Hawaiian Islands I’ve learned this, food is the staple of the Hawaiian community. Truly, the amount of sharing between families, neighbors and friends always surprises me. 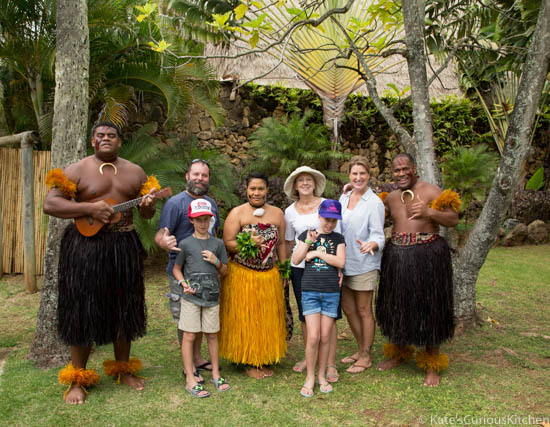 The passed down recipes and stories that go with each dish melts my heart, I’m sharing a recipe that’s from the Polynesian Cultural Center. The night we ate at their luau and my daughter about jumped out of her seat with excitement when the basket of bright purple rolls appeared. 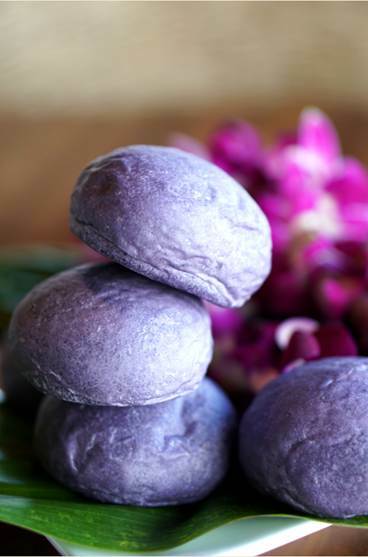 Purple is her favorite color so how could she not eat it, what she didn’t know was that the rolls were taro rolls. Yes, there is a sneaky way to add that ingredient to bread and honestly I could eat it all day long. Enjoy this recipe from the Polynesian Cultural Center and explore the other websites I have listed for you. In no way am I receiving compensation for providing the websites below. 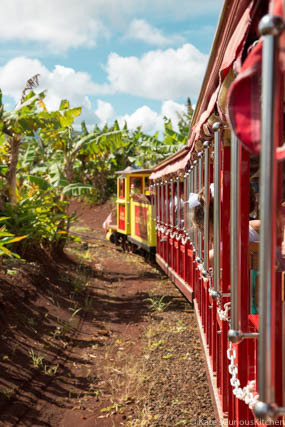 I hope you travel to Hawaii soon to explore the culture, food and magic that is Aloha. Using a table mixer, combine all wet ingredients; then gradually add the dry ingredients. Once the dough is smooth, then kneed on a floured surface. Break off pieces of dough to knead and form into small balls. Place in a greased 9 x 11 pan. Cover with cloth, place in a warm, dry area and allow to rise until doubled in size. Bake at 325 degrees for 20 to 25 minutes. 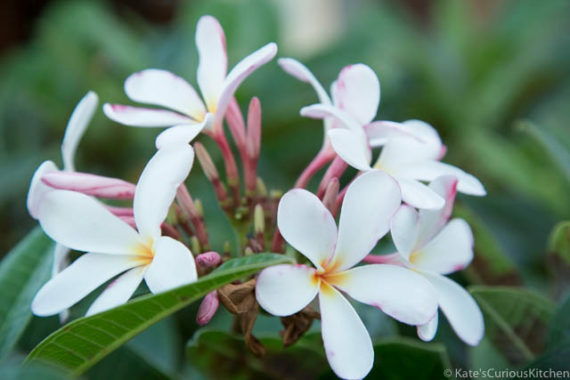 The Hawaiian culinary scavenger hunt continues! Honolulu Fish Auction. 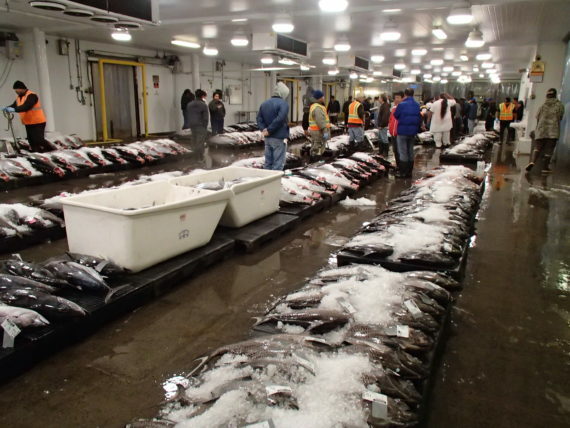 This photo is courtesy of the Honolulu Fish Market. Ready, set, WAKE UP!!! I’m not kidding this is your 4am wake up call in paradise, seriously grab some Kona coffee put on your warm clothes (not kidding you will be in a freezer) and head out on the H1 Highway to Pearl City. The Honolulu Fish Auction is your destination, if you choose to take this crack of dawn food tour, please I beg you, go on the tour, but call ahead to make sure they are open I believe they are closed on Sundays. Have you ever wondered how fish is graded for sushi? How about watching the fishing boats unload their catch? This can all be done and I guarantee you will receive an education like no other and you will love it! Even better, bring cash with you and just like the fish markets and restaurants you can purchase your own fresh caught fish at a fraction of the price. The prize I was after was a little know fish outside of Hawaii and the South Pacific, coming in anywhere between 1-18 pounds. Long about late summer when Hawaii’s waters turn cool the fish in deep waters develop a nice fat layer which adds a sweeter level to their flavor. I was after Hawaiian pink snapper, Opakapaka. This sweet and delicious fish is found at depths between 18 and 600 feet , all Opakapaka are caught by deep water hand line gear with power reels. The bright pink flesh garners a higher desire for its sashimi cuts because of delicate sweetness. Once I found my prize fish I headed back to our condo and started my food prep, the Opakapaka was seasoned and wrapped in foil then placed in the fridge to marinate. In addition I sliced up some Hawaiian sweet onions and seasoned with salt and pepper, fresh cut pineapple spears were in a zip bag with teriyaki sauce and red chili flake. Chinese long beans were in a foil pouch with sesame seed oil, sliced fresh ginger, Hawaiian sea salt and pepper. Long about 5:00pm I turned on the rice cooker and out the door I headed with our food, I was set to go make friends with that spectacular and ridiculous sized Weber grill outside. Now is where I slammed on the breaks, I turned the corner at the BBQ area entrance and you know that feeling when you walk in a room and all of a sudden every eye is on you and you might possibly be getting the judgement stare. Well, welcome to my experience, however there was a great lesson to be learned. I made my way over to a grill and started to place all of my items on the table, pretty quickly the other people a the grills were looking my way. Then the questions started, “what’s in the foil?” “What are those long green things?” “Why is that pineapple red?” “You have a whole fish in there, can we see it?” “You a chef or something?” Welcome to Kate’s Curious Kitchen impromptu cooking school, there I was teaching six men and their friends all about layering flavors, fresh caught fish and how to get out of a BBQ rut. I should have charged them but I got a few nice beers out of it so all is good. 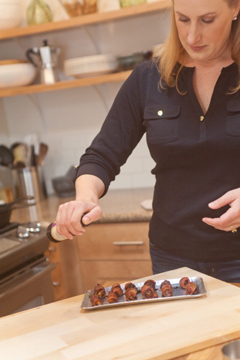 The moral to this culinary story is simple, share. Always share your knowledge, someone somewhere does not know how to cook what you are cooking and if they are interested, show them. Be open to new flavors, I really shocked the men when I grilled off some of that pineapple they were set on not liking it and low and behold there i was texting them the recipe. Simple twists and ingredient changes can develop a whole new level of flavor. Just like the previous post I have included some links for you to make your Hawaiian food shopping a bit easier, in no way am I receiving any compensation for providing these links. I just want you to have fun coking your food! Place your whole fish in a deep pan, set aside. In a bowl mix all your other ingredients together then pour over the fish. Make sure the marinade gets inside the fish too. Cover and place in the fridge for up to 4 hours, turning once at the 2 hour mark. When ready to cook, heat your BBQ Grill, if using gas light all burners on high (500 degrees), if using a charcoal grill prep the charcoal mound in the center of your BBQ. When coals are covered in white ash they are ready. While the BBQ is heating make a double layer foil packet, cut it long enough to fold in half and cover the fish completely. Imaging the foil is a sleeping bag and the fish is going to be inside of that. Take ½ the chopped green onions out of the marinade and place on the foil pack. Remove the fish from the marinade; do not brush off any of the ginger or garlic. 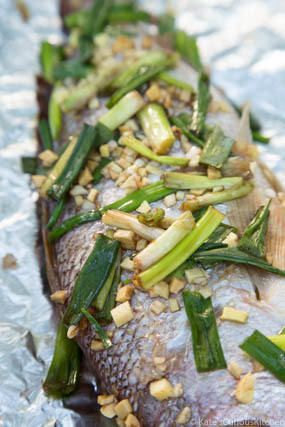 Place the fish on top of the green onions and now place the remaining green onions on top of the fish. Seal the foil up tight on all sides and take it out to your grill. Spread out the coals if using a charcoal grill, lower the two outside burners on your gas grill to medium lower the center burner to medium high. Place fish on heated grill and close the lid, after 12 minutes flip the packet over and cook another 10 minutes. Remove from grill and let it steam in the foil another 5-10 minutes while you are prepping the plates. 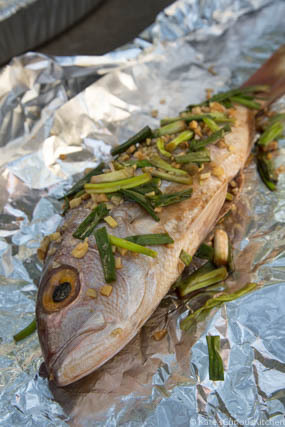 Open the foil and flake off pieces of the snapper; watch out for the bones they are long and very translucent. 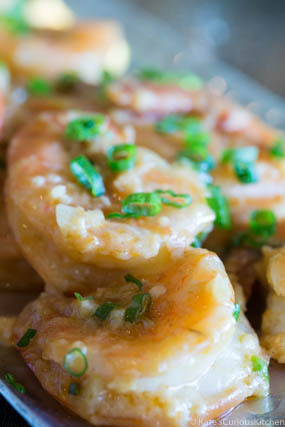 Serve with steamed rice, lemon wedges and a sprinkle of mirin sauce or just on its own, enjoy!